Hello everyone, I recently acquired a 10" Meade LX50 that already has encoders installed. Only missing are the encoder cord from the mount to the panel and a controller itself. Question is, will a Magellan I controller setup work with this scope as it is currently configured (assuming I can find an encoder cable)? My initial thought is that it would, given I have a similar setup using the Lumicon Sky Vector on one of my Celestron SCTs. I know the Magellan II was designed to be used with the LX50, but is there anything that would preclude the I from working on it, or anything else (modifications/settings?) I would need for it to operate properly? And lastly, what do I use for a suitable encoder cable? I'm hoping you get a good answer to this, speaking as teh owner of a non-Magellan LX-50 who wonders if it would be worth the effort to go that way. Thanks Bob, me too! I just received a Magellan 1 setup (a Magellan II would have been nice, but there weren't any available for sale), but I'm trying to figure out how to connect the cables to the LX50. Even though I have the user's manual for the Magellean I, all it says to do for connections is to refer to the specific information supplied for the scope you have. There is absolutely no online info out there for that. This is the problem I'm faced with: On the left fork arm of my LX50 is an outlet labeled "Encoder" as well as another one the same size (just like the size on an Autostar 497 cable) on the scope drive control panel. In addition to the encoder outlet is the Handbox outlet which is smaller, an RS-232 IIRC. The Magellan I cable set has two RS-232 plugs as well as a wide one. I assume the wide one plugs into the outlet on the handbox, but what of the other two RS-232 cord plugs? I have a spare Autostar 497 cable, I assume I can use that to connect the two "encoder" ports from the fork arm to the drive. But I'm left with a leftover RS-232 cable out of the handbox. The LX50 Magellan connections are normally as follows: There is an RJ45 to RJ45 (8 pin / 8 wire) encoder cable that connects from the socket on the fork arm to the Encoders socket on the control panel. The Magellan connects in place of the normal handset to the Handbox socket on the control panel using an RJ22 (4 pin / 4 wire). There is an optional RJ12 (6 pin / 6 wire) socket on the Magellan Handbox that can be used to connect to a computer via RS232. Normally, you would connect the encoder cable from the fork arm to the control panel and then simply plug in the Magellan's RJ22 to the Handbox socket on the control panel. That's all that is required. I don't know that I have seen a Magellan I. Can you post a photo of the bottom connections? I have a Magellan II for my LX50 and it sounds like your Magellan I may have more (or different) connections. 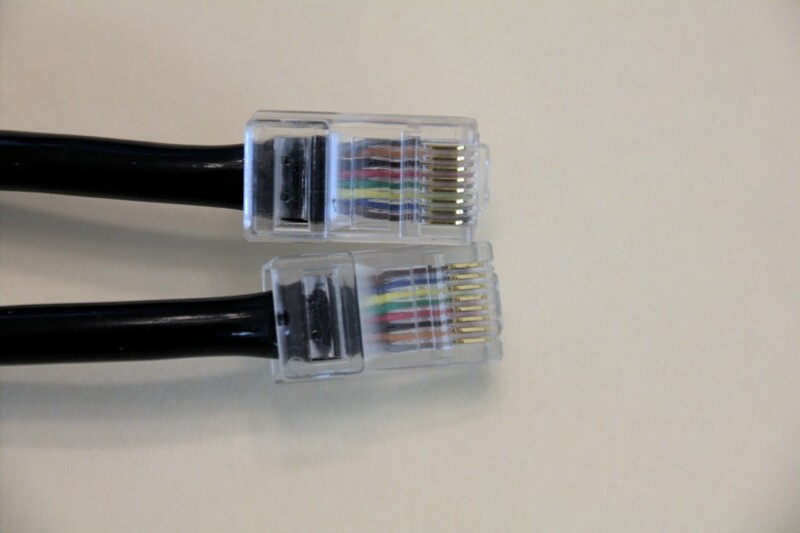 Here is an photo of the encoder cable showing the two ends so you can determine the pin-out connections. It's pretty easy to make up these cables so long as you have a crimping tool. If you can post a photo of the Magellan I bottom sockets, I can determine if they seem to be the same as the Magellan II connections. If so, I will also post a photo of the two ends of the RJ22 cable that connects the Magellan to the Handbox socket on the LX50 control panel. I am not sure whether the Magellan I will work in place of the Magellan II. It is certainly worth a try if you have everything required. To my knowledge, the only difference is that one was meant to work in Alt-Az mode (Magellan I) and the other was meant to work in Equatorial mode (Magellan II). The firmware may be hard-coded in the two Magellans or it's possible it may be able to sense the scope difference and just work -- I simply don't know for sure. You don't need an additional cable for the Magellan I. That was for the II, only, which was intended to use the scope drive/electronics to allow the scope to slew the last degree or two to the target. the Mag 1 is just two encoders connected to the computer. Uncle Rod's post made me look up the Magellan I. It is indeed a VERY different beast from the Magellan II. I had been under the impression that they were more similar. I now see what Rod meant about not connecting to the mount. The Magellan I appears to be simply a digital setting circle readout box. The Magellan II allowed some control of the mount functions. When using the Magellan II, you select an object, push the LX50 around until the Magellan II shows you are getting close, then you can press a button to slew the remaining couple of degrees to the target. The cable photo I posted above may be of no use to you. While it is possible that Meade used the same cable to connect the encoders to either a Magellan I or Magellan II, there are no guarantees. If you have any shot at getting the Magellan I to work on an LX50, you will possibly need a special custom cable to go from the encoder socket on the LX50 fork arm to the Magellan I unit. The Encoder socket on the LX50 main panel will not be used. The normal LX50 Handbox for telescope control will remain connected when using a Magellan I (assuming the Magellan I can be made to work at all). Hi Rod and John, sorry it took a while to get back, thanks for the info and the links! The RJ45 plug for the wire set I have plugs into the handset; that cable then splits into two separate cables with RJ22 ends for which the LX50 has no jacks of that size, except for the one labeled "handbox" which I wouldn't use in this case. Either way, the cable ends are the wrong size for the RJ45 "encoder" jacks on the mount (fork arm and base). Would there be RJ22 to RJ45 adapters that could be used or is this too much effort to be worthwhile? To be honest, the best working Magellan I I ever saw used a set of encoders from JMI. better mountings was at least part of it. Theoretically you could do it either way -- make a completely new cable or just make an LX50 adapter cable. Either way, you are going to need someone with a Meade telescope that accepts a Magellan I to help reverse engineer what is needed. I will be happy to help with the LX50 side. You will need to find someone with a Magellan I compatible scope which has the encoders installed. You have to find out which encoder pins from each of RA and DEC go to which pins in the bottom of the Magellan I. Then you will need someone to determine how the LX50 encoder pins for RA and DEC are wired to the fork arm connector. (I can do that part.) Finally, given those two pieces of information, a new custom cable can be specified and built which will connect the Magellan I to an LX50 at the fork arm connector. Even after doing all this, there will be a few additional details to figure out. First will be to find out whether the encoders used on the Meade dobs are the same part number and resolution as those used in the LX50. That may affect the pin-outs of the cable. Finally, any gearing and resolution differences will have to be worked out to ensure that the encoder ratios programmed into the Magellan I are correct or whether they may need to be adjusted. All this work is part of the reverse engineering I mentioned in post #7 above. It could be done and would be a good fun group project that might end up benefiting a number of users in addition to yourself. To even get started, though, you need to find someone who can help verify the design of the Magellan I encoders and cable. Edited by jdupton, 16 June 2016 - 06:24 PM. For sure you will likely have to play around with setup. Buddy of mine got a Mag I, trashed the encoders and used them with, as I said, JMI encoders. Took him a while to figure out how to set the computer up. When he did, though, it worked fine. Pinout should be fairly standard; same as with a JMI. Edited by rmollise, 18 June 2016 - 10:00 AM. Understood on the time investment for reverse engineering the required connections. Electrically, if the pin-outs were known, it would be trivial to make up the necessary cable. Regarding cables already available to use the Magellan I on an LX50, I don' recall ever seeing such a thing. I purchased my LX50 (7" Mak version) in 1996 and had to wait about 4 months for the actual release of the Magellan II. I recall watching developments related to the Magellan interfaces while waiting for my pre-ordered unit to arrive. I don't remember ever seeing an advertisement concerning the use of the Magellan I on the LX50. It may be that the "different" configurations they talk about referred to the use of the Magellan I on their line of Dobsonians and classic German Equatorial mounts. There would likely have been different cable sets for each. Still, I am convinced that using a Magellan I on an LX50 is possible. It's just a matter of finding the correct collection of present day owners who are interested enough to collaborate on gathering the required cable pin out information to make up a working adapter cable. Even though I don't need one since I use my Magellan II, I would like to participate if anyone ever starts such a project. I have done extensive work on reverse engineering other aspects of the LX50. I am trying to anticipate the day my LX50 motor controller board dies and wish to have a replacement on hand to revive the scope. For me, the LX50 has a sufficiently nice set of features and a relatively simple interface that I like. I have GoTo Atlas and HDX110 mounts for imaging but continue to use the LX50 to this day for public star parties and outreach events. I want it to live on more or less as is. Meade never intended the Mag I to be used on the LX50; the Magellan II was to be the thing, since, as I mentioned, it would offer Semi-goto. Unfortunately, they never quite got the firmware in the LX50 (required) correct, so it didn't work right--well, I recall that the last of the LX50s finally cured the incompatibility problems. They basically intended the Magellan I fro their inexpensive Dobs and for the LX-10 SCT (great little scope). Ah, that pretty much confirms it, thanks; it certainly explains the difficulty involved in making it work. I think I'll just be patient, wait for a Mag II to appear then do what I can with that. Anything, even if not ideal, is better than nothing to make the best use of what I have in my suburban environment (without changing the mount that is). By the way, I just obtained a copy of The Urban Astronomer's Guide, a great read! Buddy of mine used the Mag 1 computer with a set of encoders/mounts from JMI. Worked fine. Had to tinker with the settings a bit, but apparently it wasn't a big prob . the following quote from this thread makes me wonder... any idea if a magellan II controller could be used in place of a missing lx50 hand control to achieve slewing function on an lx50 system? the lx50 hand controls look to be unobtainium these days, while every now and then a magellan II controller shows up on the used market. thoughts or experiences? > "The Magellan II allowed some control of the mount functions. When using the Magellan II, you select an object, push the LX50 around until the Magellan II shows you are getting close, then you can press a button to slew the remaining couple of degrees to the target." Yes, it could. However, some of its functions didn't work or worked marginally (depending to some extent the version of the firmware in the telescope's base). It would work as DSCs, however. And it should be possible to move the scope with it. What doesn't work? The function where you push the telescope partway to the object, and Magellan II will slew the rest of the way. AFAIK, Meade never got that working. Yes, the Magellan II is a direct replacement for the standard LX50 Hand Control. I have both on my LX50 and use them interchangeably as required for what I am doing. At public outreach sessions where I am only going to be viewing the Moon or planets, I use the standard Hand Control. If I am out doing casual observing in light polluted conditions, I will often use the Magellan II. Both units have the same interface and cable. If you have an LX50, either can be used. The Magellan II will be a little more difficult to use, though. The LX50 mount must be pretty well polar aligned for Magellan to successfully be star aligned. If the alignment step fails, most functions will not be available. I do not recall whether the scope can even be manually slewed if there has not been an alignment done. I'd have to set up the scope and try it out. Also note that the LX50 can only slew a couple of degrees in declination because it uses a tangent arm rather than a declination drive gear. As Rod indicated, the internal mount firmware level also has an effect on functionality. Watch the power LED as you turn on the mount with no hand control connected. If the LED only blinks once (never seen one) or twice, the Magellan II will not function correctly. If the LED blinks three to six times, the firmware level supports the Magellan II. That blinking of the power LED on the mount at power up shows which level of Firmware is installed. Versions 3 through 6 are what you want. Edited by jdupton, 28 December 2018 - 10:06 AM. this is great information, thanks! i think it'll be worth tracking down a magellan II to serve as an lx50 hand controller. good info, i think so long as it will move the scope than a magellan II would be covering all of the functionality of the lx50 hand controller, albeit with a few extra steps to get there. ps: love your SCT buyer's guide, been an essential reference for me over the years! All very good info. But...does my memory fail me or...didn't the LX50 have a worm drive for declination rather than a tangent arm? Edited by rmollise, 29 December 2018 - 10:46 AM. No, unfortunately, it has a tangent arm declination drive. The LX50 is a Push-To scope. With the Magellan II attached, you push it using the Magellan display as a guide for when you are getting close and once the readout switches from "degrees away" to the "bar-length" proximity display, you can push a button to make it slew the rest of the way and (hopefully) center the target under the mount's power.